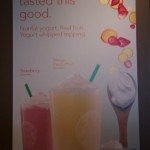 Starbucks is testing new yogurt-based beverages which are called “Frappuccino Smoothies.” One is the Mango Passionfruit Smoothie, and the other is the Strawberry Smoothie. These are not the same smoothies that are readily available everywhere. First off, these new drinks do not include a banana. Secondly, one of the main ingredients is a sweetened non-fat yogurt. These smoothies are only in a small test market in California, so please do not rush to your local Starbucks thinking you will find these. (Though I really wish I could do that!). They sound delicious!! I had a couple of different readers emailing me about this test, and I owe a lot of thank yous for the attached photos. 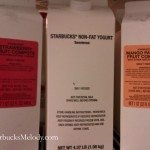 Both smoothies start with the barista pouring non-fat yogurt to the lower line of the Frappuccino measuring cup, then adding a designated amount of the fruit compote, then ice, and then plain Frappuccino syrup base to the mix. As is obvious, it all gets blended in the blender. The beverage is served with a whipped yogurt topping. Every time I write about test beverages and products, I always include the small warning that most test beverages never launch nationally, so please do not hold your breath waiting for this. Starbucks tests the honey vanilla Vivanno. – This honey and yogurt smoothie had a wonderful tangy-ness, a delicious flavor, and was tested in 2009. I heard that it didn’t sell well, but I thoroughly enjoyed it. Has anyone here tried these two new test beverages? Which one is better? Mango Passionfruit or the Strawberry one? What city(ies) in CA have them? I’m in the Bay Area but would drive a few hours, if need be, to try them. Interesting that they are doing this. Is it because they now have Evolution Fresh and have opened a cafe? I bet they would be popular around here. Does anyone know how much sugar are in the drinks? It is hard to read the ingredients. @purple1 – that was my question too. I’m not sure why there is a need for sweetened yogurt if there is fruit and juice in the drink too. Anyone in this test market have the ingredients/sugars info they can share? Hi Purple1 – Sorry, I don’t know how much sugar is in these drinks. I was hoping that someone who has tried them would weigh in here, but since this is a very small test, maybe that’s not likely. I doubt this has anything to do with Evolution Fresh. One friend of mine commented that the strawberry smoothie sounds like something that Tully’s has just launched, but since Tully’s has such an extremely small market share, I doubt that’s a motivation to launch this. I assume honestly that for years, Starbucks has been trying to figure out how to expand the smoothie line. There was the 2009 test and probably others that I don’t know about. Apparently smoothies do well here in the US, so I assume they want to grow that customer segment. I wouldn’t expect these to launch beyond the test market. Maybe yogurt based drinks are just not meant to be. @Ben – Thanks for weighing in! You would think people would like yogurt smoothies! Alas! I’m sure Starbucks will keep trying until the find one that is popular. Ben – what market are you in? @David – I usually don’t put specific store information in blog posts about tests – for a couple of reasons. If you want to email me for more info, I am melody @ starbucksmelody dot com. It can take me a full day to get back to you because I’m busy at work. 🙂 Thanks for your understanding! Ugh, just had one of these “new” smoothies in a store in Northern California and it was absolutely awful. While the old one may have been less that ideal from a health perspective since it used a cream base; i thought it tasted substantial– the whole banana and protein went a long way for that. I think most people were put off since it wasn’t very sweet; but I actually liked the tart taste of it since I don’t need to be overloaded with sugar. 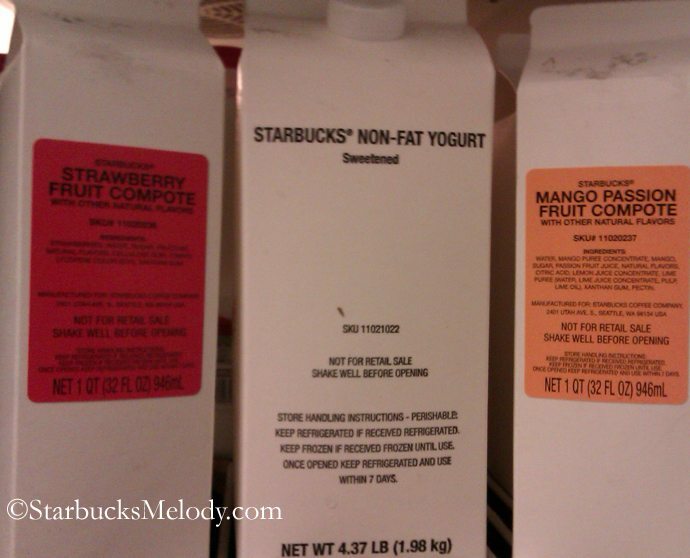 The new one tastes like blended ice with a touch of strawberry flavor; and comes completely out of a carton. I was completely unsatisfying and honestly, I think the McDonalds Smoothies taste better than this one. I sure hope this one doesn’t stick around because I for one will not be ordering it! Not only that, I can’t even order a banana to eat plain, since the store is no longer carrying them since it is not a required ingredient for the smoothies. Double fail. @Ryan – are these supposed to replace the original “Vivanno” smoothies? I hope not. @Ryan, and CD – I completely didn’t realize that the intent was to replace the existing smoothies with these new one. Actually, I think the existing smoothies are reasonably healthy. 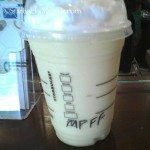 Banana, milk, protein powder, ice, and and some fruit juice like the orange-mango or even mocha, is actually pretty reasonably healthy – Probably moreso than many other Starbucks beverages. I want a smoothie because it’s healthy. Guess what? Cream base is not healthy! Not even close! I can’t see these doing well for that very reason. The partners in our store drink smoothies all the time because they are what they are, and smoothies sell in our store like crazy for the same reason. Cream base is LOADED with an insane amount of sugar. I wish they would just bring out yogurt to add to them they way that they are. @Ryan there is no cream base it what is now available. It’s fruit puree, (or mocha in the chocolate) a whole banana, ice, milk and protein powder. That is it. And with the new blenders they are not hard to make. @Mel That was the impression that I got when I went to Starbucks this morning; they didn’t have the old smoothies, and stopped carrying fresh bananas so they couldn’t make one even though they had the remainder of the ingredients. They were also removed from the menu and the smoothies all had a little “New” designator after them. This realization actually started when they guy taking my order asked what size smoothie I wanted; I replied “I thought they only came in one size” (Because the old ones really did only come in one size!) at which point he explained that these new smoothies are the replacement for the old. @Beenaround You are correct; they were milk based, not cream; The guy at the counter said that this morning when he was explaining the difference between the old vs new and I took his word for it. However, the starbucks site does not corroborate his statement. Wow – sad day if Starbucks gets rid of the Vivannos/Smoothies. The protein (and fiber too, right?) mix, combined with the simple ingredients (milk, ice, banana, orange-mango or chocolate or strawberry) made for a better-than-average drink/meal replacement. I understand you can get protein from yogurt, but the added sugar takes away most of the benefits. I really am disappointed in SB if they are adding these new smoothies with so much sugar. I just cannot understand their logic for introducing this to their drink board. Also, curious as someone had said they test different recipes of new drinks. When they do this, besides the sales of a particular drink how do they know which recipe is better? Do they ask customers in the test region to fill out forms? Or do these customers really realize this is a test drink? Unless of course you are reading this blog! Well my above comment about Kinetix is way off base. I heard from a very knowledgeable partner that the smoothies haven’t used Kinetix for years and years. @purple1 – People LOVE sugary drinks. They sell. Hence, Frappuccino happy hour, and new, syrups seasonally are all just sugar sugar sugar. It doesn’t bother me at all – this is what consumers are buying. I just don’t want to see the healthy current smoothie option go away. If the current smoothies don’t sell, maybe that’s what is going on, but in any case, I like the smoothies. Oh Melody I totally agree with you about how people like sugary drinks without question. I see it all the time at SB and see people asking for partners to add more syrup. I just hope as you that they keep the healthy drinks on the menu. What does that say about how SB views their customer? But, they would not be the only company that expands their menu to include sugary drinks. I had the mango passionfruit one last night. It was awesome. I’m in Sacramento (evidently one of the test markets) and it was in the 90’s here..perfect temp for a smoothie! It was more passionfruity than mango tasting but there was a nice tart aftertaste. The whipped topping seemed to be a cross between coolwhip and vanilla yogurt. I really hope they’ll add these as a staple to the menu; it was nice having something that didn’t feel like pure sugar like most of the frapps. Sounds yummy. I’m heading to Pasadena, CA in a couple weeks, hopefully there is some testing going on down there. As for replacing the current smoothies, I could definitely see it. Keeping fresh bananas, at the appropriate ripeness, while not tossing out cases of “old” bananas, or using green ones in beverage production, is not the easiest. If I do get to try one, I will be back to comment, for sure. I’ve tried the strawberry one and it tastes fantastic. I really enjoy the slightly tart tang from the nonfat yogurt, but I wish I could get nutrition information on it. The website still only shows the old smoothies (with banana and protein/fiber powder) and they don’t serve those in my area anymore (Sacramento). I got an e-mail about these and went to my local Starbucks, but they aren’t carrying it. Nowhere in the e-mail did it mention anything about it being a test or only at certain Starbucks. In fact, it said to go and get one before the half-price happy hour is over on Sunday. I’m in San Diego. Called the 800 # and they had no idea which stores had it, in fact they had never heard of it either… weird. So a few days ago I got another e-mail that sort of apologized for the first e-mail but instead of a “healthy” frappachino it offered a choco chip mocha crunch crumb… blah blah blah.. anyway my e-mails to customer service have basically been treated like i’m crazy and they have never heard of it… pretty annoying. @Alex – That’s strange – I didn’t get a second email apologizing for the first. But anyways, I am very sure the first Starbucks email was a mistake. The yogurt smoothie email makes no sense. Maybe even a Frozt email would make sense because that is a MUCH larger test. While I think Starbucks Customer Service does the best they can, I’m not always convinced that they’re up on the very latest Starbucks information – they’re not partners, rather they’re contractors really. I’m not saying that they don’t provide good customer service for most situations, but they’re a little disconnected from Seattle since they’re outsourced and subcontracted… They probably have to make an extra effort to keep on top of the latest Starbucks news. ??? I had the strawberry flavor in Roseville Ca on Wed. It was delicious! Low in calories with a wonderful flavor. Very satisfying and great since I’m on Weight Watchers. Hope it gets picked up! They are at Target Starbucks here in Florida, and I love them! They basically taste like yogurt based smoothies, so many people are not huge fans, but I love them myself. Anyone know of a Starbucks around Burbank, CA that is carrying this smoothie? I would love to try it! I haven’t tried the strawberry smoothie yet, but I’ve had the mango passionfruit variety, and it’s delicious! Love the taste of passionfruit. The drink has a nice tang to it, & isn’t overly sweet. Very refreshing on a warm day. I’ve purchased the drink in the Sacramento area. I saw these at the Colfax, CA Starbucks yesterday. I didn’t try either one, but there was a lot of merchandising for them. I love both the Strawberry and Mango Passion Fruit. I tasted the Strawberry yesterday and it is not sweet at all – very light and tasty. Tonight I purchased the Mango and asked the Barista to add 2 Splenda and it was perfect. Very pleased and I am now addicted – anyone know how many calories? I can’t seem to find info. We have them in Jackonville, fl and I love them! Lori I so want to try one! Which one was your favorite? Thanks for finding my little site – please facebook “like” it too – See right hand side column. I am Jacksonville, FL too…and LOVE the Strawberry. I really wish we could find the nutrition information. I emailed the company and am waiting for a response. I will share if I hear of anything. If anyone wants the nutrition information, you can go to Starbucks.com and send in a question to customer service. I received the nutrition info within 24 hours by email. 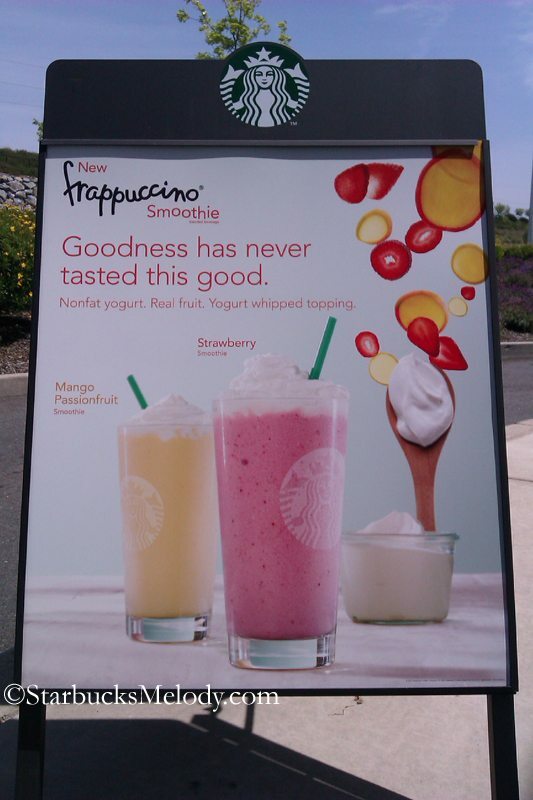 I got just the info for the Strawberry Yogurt Frapp…it is low in fat…but still has a fair amount of sugar. I can’t copy and paste the entire chart here, but as an example, a Grande without whip is 190 calories…5 calories from fat…but there are 41 grams of sugar! With whip it’s 260 calories and mostly fat related calories…35 from fat. And the sugar is also proportional. Still yummy…but if you are watching your sugar intake…might not work.